Stafford was unusual, but not unique, in having a thriving English Catholic community before large numbers of Irish Catholics arrived during the Famine. This produced a complicated situation if Protestant agitators tried to rouse anti-catholic feeling in the local population. There were many in the town’s elite who wanted nothing to do with sectarian conflict. It was bad for business and social relations. There is little local evidence about the nature and strength of Catholic beliefs amongst Irish immigrants to Stafford during the Famine. Although descendants of these families have been interviewed, they have no direct evidence of the new arrivals’ experiences or attitudes in the form of letters, diaries or legends. But the mass of poor immigrants must have faced St Austin’s Catholic Church with mixed feelings. There was at least an active and secure Catholic mission. Its priest was Rev. Edward Huddleston, ‘a worthy scion of one of our most ancient Catholic families’. It was said that his ‘unobtrusive and courteous manners and kindness of disposition had won him the esteem of the inhabitants of Stafford generally.’ He had some record of positive help to Irish immigrants, but by the time the Famine Irish came he had been at St Austin’s for more than sixteen years and was approaching retirement. The mission had ‘taken the shine out of him’. The Irish faced, therefore, a parish with a tired upper class priest and a stratified English congregation dominated by its upper class patrons. If and when the Catholic Irish went to mass they milled around the walls and doors of the church whilst their Staffordian co-religionists occupied the paid pews and free seats in the centre. It was not an experience to make them feel welcome. The degree of social interaction was probably low and in this undemonstrative ‘old Catholic’ church the few other activities going on were equally exclusive. In August 1850, for example, a ‘Roman Catholic tea party’ was held at Stafford Castle. 700 people attended, including many Protestants, but few of the poor Irish trailed up the hill to the event. Exclusive as the local church was, the national outbreak of Protestant agitation in 1850 against the restoration of the Catholic bishops probably helped to unify the congregation. In early December a four-hour public meeting was held in Stafford to protest against this ‘papal aggression’ and an Ulsterman was one of the most vitriolic speakers, the Presbyterian minister James Speers. 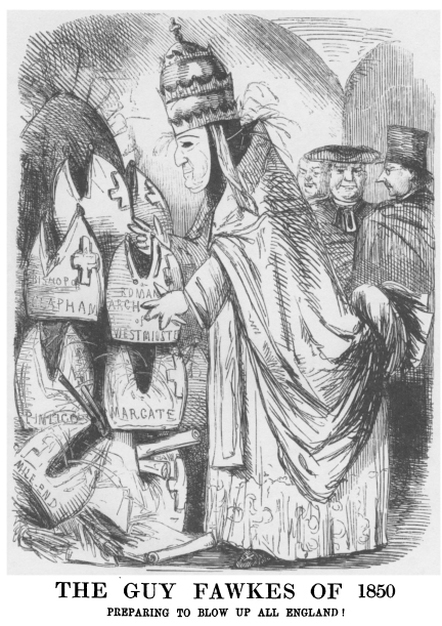 Cartoon in ‘Punch’, 1850, with its anti-Catholic ‘Papal Aggression’ message. His made an anti-Catholic joke in stage Irish about Irish ‘Pat’, but no-one else at the meeting said anything public about Stafford’s Catholic Irish. Indeed, Alderman Boulton ‘urged people not to leave the meeting with bitter or acrimonious feelings against their Roman Catholic neighbours’, a comment that shows some of the town’s elite wanted to treat sectarian issues with kid gloves. Nevertheless, 1,000 people subsequently signed an address to the Queen and Prime Minister against ‘papal aggression’. Anti-Catholic agitation continued to be fomented by Speers into 1852. The rabble-rousing ex-monk Alessandro Gavazzi visited Stafford’s Lyceum Theatre in January 1852 and Speers proposed the vote of thanks. ‘Father’ Alessandro Gavazzi (1809-89), renegade Catholic monk and violent anti-Catholic agitator. The following night he seconded a resolution to set up a Protestant Alliance in Stafford and he later chaired its public meetings. Members of the local Protestant aristocracy and gentry supported the Alliance, but the whole enterprise faded away. There was little stomach for violent anti-Catholicism in Stafford. 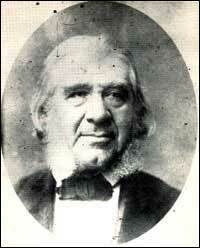 When the rabble-rousing Baron de Camin came to the town in 1856 he only attracted a ‘small’ audience for his speech. In 1856 Speers returned to his Ulster roots in sectarian Belfast and with his departure the Stafford lost its most public anti-Catholic voice. This shows the local press expressing the local élite’s desire for social peace and making it clear that they saw no advantage in ethnic or religious conflict. Although hundreds of Irish people continued to live in Stafford for the rest of the century, evidence for anti-Irish violence and assault is almost impossible to find. If native Staffordians had anti-Irish and anti-Catholic attitudes, and many no doubt did, the social environment acted to repress their public manifestation. In this Stafford differed from other areas of Britain, especially the industrial areas of the North, Wales and Scotland, where periodic anti-Catholic and anti-Irish violence continued for the rest of the nineteenth century. J. Herson, ‘The English, the Irish and the Catholic Church in Stafford, 1791-1923’, Midland Catholic History, No. 14, 2007, pp. 23-46. J. Gillow, St Thomas’s Priory, or the Story of St Austin’s, Stafford (Stafford, locally published, c.1892-4), p. 110. Staffordshire Advertiser (SA), 18 October 1856; comment made at the time of his retirement. In 1834 he had led a campaign to save two Irish labourers from the gallows after they had been found guilty on a trumped up charge of assault on constables. Gillow, St Thomas’s Priory, pp 112-3. M.W.Greenslade, St Austin’s, Stafford: a History of the Catholic Church in Stafford since the Reformation, (Stafford, 1962, p. 17). This comment was made in 1861 after his retirement. Many of the Irish who came to Stafford during the Famine years and the 1850s had been evicted from their land in Ireland, particularly in the Castlerea district of Roscommon, Mayo and east Galway. Famine evictions started early in the Castlerea area, and it was the scene of one of the most notorious ‘exterminations’ to take place in Ireland during these years. It happened at Ballinlass townland near Mount Bellew, Co. Galway. The land was owned by Mrs Marcella Gerrard, an absentee who, with her husband, lived in Co. Meath and owned extensive cattle-rearing estates in Connacht. 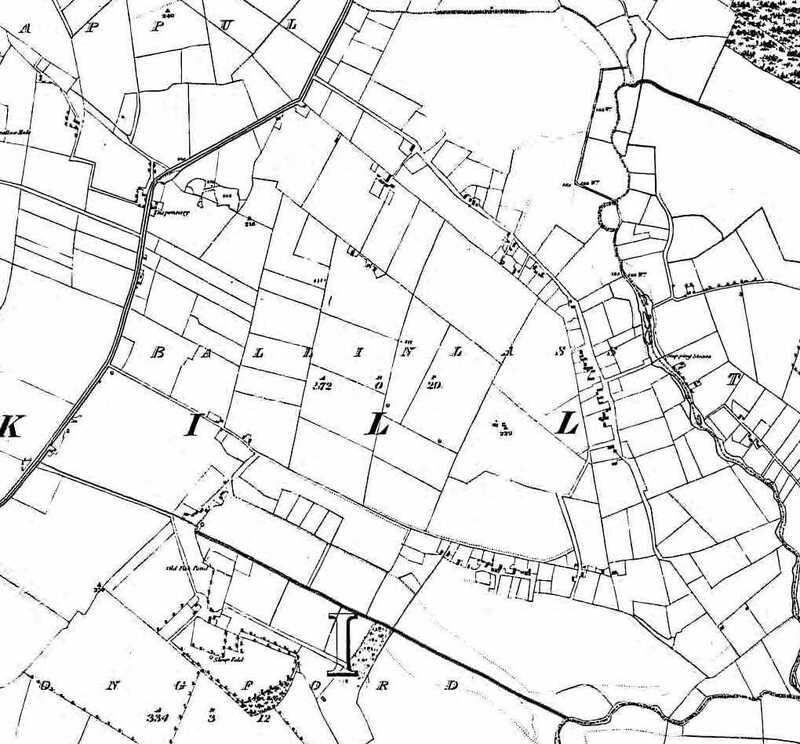 Ballinlass townland before the Gerrard eviction showing the houses scattered along the tracks. Around 400 people were living here in 1846. The tenancy arrangement at Ballinlass was typical of the evils of landlordism in pre-Famine Ireland. In 1827 the Gerrards had let their land to thirty tenants but then they colluded in allowing one of them, ‘Wealthy Tom’ Gavin, to become the middleman who paid all the rent to the Gerrards. The rest had to pay Gavin as undertenants. About forty other people then became undertenants of these undertenants, a diffusion of tenancy common in pre-Famine Ireland. But in 1842 Gavin absconded leaving rent arrears of £40. The undertenants offered to pay their rents directly to the Gerrards, but the latter refused to accept the money and used legal chicanery to obtain an enforceable ejectment order. In other words, the landlord seized her opportunity to clear ‘surplus’ people off the land and convert it to profitable grazing. It was alleged that Mrs Gerrard’s agent ordered her other tenants in the district to deny shelter to the homeless of Ballinlass, and although the order was sometimes disobeyed, it seems the majority of victims were forced to huddle in the ditches along the road to Mount Bellew. By the end of the month some were in Mount Bellew itself and in other local villages. A year later some were still in the district and in a pitiable condition. On 18 April 1847 Pat Gibbons, ‘who was one of the tenants ejected by Mrs Gerrard’ and ‘who had suffered much from severe destitution’ died on the road a mile and a half from Mount Bellew. His body lay by the roadside for over a day because no one would provide a coffin. Other people and families ended up in a similar state, struggling for survival and forced into the workhouses, often to die there. Most of the families that survived were forced either to emigrate or to send people to England for seasonal work. What have the events at Ballinlass got to do with Stafford? The answer is that some of the Gerrards’ victims may have settled in the town during and after the Famine, although it is impossible to be definite because their surnames were common in east Galway. In 1846 the Tuam Herald published a list of the heads of families evicted from Ballinlass. Four of these people were Patrick Mannion, James Monahan, John Walsh and James Egan. In 1851 a Patrick Mannion was to be found in Stafford. He was then a forty year-old widower, working as a labourer. It is known that he had connections with Moylough, the parish next to Ballinlass, so he may have been a victim of the Gerrard eviction who ended up in Stafford and established a family line still to be found in the town today. Families named Walsh, Monaghan and Egan also settled in Stafford. They too may have been survivors of Ballinlass. These tragic events in Ireland may therefore have had direct consequences in the town. Mrs Gerrard had ‘exterminated’ Ballinlass in order to turn the land over to profitable cattle pasture. Dramatic as the eviction was – and the word ‘Gerrardising’ became commonly used for evictions in the Castlerea area during the Famine – it was only one case amongst many. By August 1846 the Roscommon Journal was saying eviction was ‘the order of the day’. Stafford’s Irish population was suffused with many people and families from the Castlerea district whose lives had been shattered by the Famine and eviction. They had to begin life again and respond to new challenges in a new environment. Victims though they were, those who settled in the town under such circumstances subsequently showed many divergent paths in both their own lives and those of their descendants. The Freeman’s Journal, 2 April 1846: letter from John N. Gerrard and article, ‘Landlordism in Ireland: the Gerrard Tenantry’. Roscommon Journal (RJ), 14 March 1846. Eye-witness account of Head Constable Dennehy of Mount Bellew, in the second article of ‘Landlordism in Ireland: the case of the Gerrard tenantry’, The Freeman’s Journal, 28 March 1846. First article of ‘Landlordism in Ireland: the case of the Gerrard tenantry’, The Freeman’s Journal, 27 March 1846. Tuam Herald (TH), 24 April 1847, a report quoted from the Galway Vindicator. TH, 4 April 1846. The same list was published in The Freeman’s Journal article on 27 March 1846 but with typographic errors. 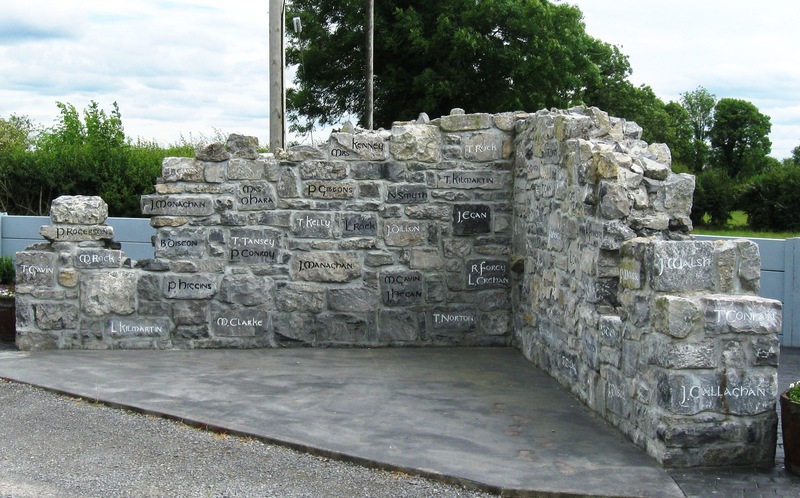 It can also be found on the memorial at Ballinlass itself that was unveiled in 2011. In 1772 Stafford had been by-passed by the new Staffordshire and Worcestershire Canal and it took until 1816 before a branch was opened into the town by canalising the River Sow. This waterway terminated at the Green Bridge in a separate short stretch of canal alongside the river and it was here that a coal wharf was established. The branch fell out of use and became derelict in the 1920s but there is now a campaign to reopen it as the Stafford Riverway Link. The canal coal wharf was the scene of a tragedy at Christmas 1857. On the morning of 29 December a little boy named Martin Kearney was drowned in the canal. He was the son of Thomas Kearney and Ellen Kennedy and he was just three and a half years old. Thomas and Ellen had both arrived in Stafford during the Irish Famine of the late 1840s. In 1851 Thomas was a bricklayer’s labourer lodging in New Street in the north end whilst Ellen was also described as a ‘labourer’. She was lodging in Allen’s Court in the town centre with the Raftery family from Co. Roscommon. Thomas and Ellen both came from this part of Ireland and perhaps they already knew each other. All we know is that they got married at St Austin’s on 20 October 1851, one of many couples who came together to start new lives in the Famine’s aftermath. Their son Martin was born in 1854 and he seems to have been Thomas and Ellen’s first surviving child. They were a poor family who existed for decades in some of Stafford’s worst slums. On that winter’s morning of 1857 Martin had been sent to the coal wharf with a ‘youth’ for a wheelbarrow load of coal. The family was then living in Cottage Street, so little Martin had a very long walk to get to and from the wharf. After they had brought the coal back to Cottage Street the pair had to traipse back to the wharf to return the barrow, although perhaps the youth gave Martin a ride in it. All we know is that, once there, Martin somehow got separated from the youth and fell in the water. John Waltho, a prison warder who happened to be passing, saw the boy in the canal, gave the alarm and he was dragged out of the water. It was too late. No doctor could be found in the vicinity and Martin was carted off to the Infirmary where he was pronounced dead. At the inquest it was reported that a knife had been found in his hand and the speculation was that he had tried to cut a twig from a willow tree overhanging the water and had fallen in. The fact that a three year old boy was in possession of a knife is frightening but the inquest jury made no comment on this fact and neither did it make any reference to the actions of the youth with him. The verdict was merely the factual one that Martin Kearney, ‘the child of Irish parents’ was ‘found drowned’. Death was commonplace amongst the children of the poor in Victorian times. Thomas and Ellen Kearney remained in Stafford and had at least six more children after Martin but only three made it to adulthood. A second son called Martin lived only a year, so it was an ill-fated name in the family. Thomas spent the rest of his life working as a bricklayer’s labourer and for over twenty years they lived in a cottage in Back Walls North. Ellen died in 1891 and Thomas must have had some miserable final years as a widower. He was attacked at least twice by his violent son, Patrick James, and he died in 1900 an isolated man that sink of poverty, Snow’s Yard. The three surviving children all seem to have emigrated. The Kearney family had lived in Stafford for over fifty years but in the end they were long-term transients for whom the town had proved a mixed blessing. Stafford Borough Council burial register entry 01/340, Martin Kearney, 31 December 1857; his address was given as Cottage Street. Staffordshire Advertiser, 2 January 1858. Poverty and insecurity in rural Ireland was what drove Irish workers to come to Stafford. Many of Stafford’s Irish families came from an area of Roscommon, Galway and Mayo centred on the small town of Castlerea, Co. Roscommon. That is not surprising, since in pre-Famine times it was an area blighted by land hunger and landlord oppression and one of the main generators of migrant labour in Ireland. Coming over to England – and Staffordshire – to work on the harvests was one way to earn money to survive and pay the landlords’ rents. Irish harvest workers started coming to Staffordshire in large numbers in the 1820s. At that time they were a rather shadowy presence but by 1830 there were enough of them to arouse anti-Irish hostility amongst local workers. In August 1830 four local men were convicted in Stafford of an unprovoked assault on ‘defenceless Irishmen who came over … at this season of the year to do harvest work’. These were men like Michael Byrne, Dominick Dooley or John Gallagher who, in the summer of 1841, were lodging in stables, barns and poultry houses in the Stafford area. Initially there was little incentive for these men to settle permanently in Stafford. They earned their precious money in England and then went back to their families in Ireland. The Famine began to change things. Stafford received many Irish who were forced out by starvation, destitution and eviction by landlords. Many came to the Stafford area because they had worked there before or because they knew others who had. Many now brought their families with them and settled permanently but others still clung on in Ireland and continued to come over just for harvest or other labouring work. Information on where these people worked and the jobs they did is sketchy but estate records in the Staffordshire Record Office give us some clues. At Salt and Weston Quarries owned by the Earl of Shrewsbury ‘three Irishmen’ were given spasmodic work in the autumn of 1847. They earned 1s 6d a day. Around the same time James Dunn, James Fergusson and William Keen who, from their names, may also have been Irish, were employed more regularly but after 1849 the quarry was run down and no Irish got jobs there. On the Earl’s Ingestre estate six Irishmen were intermittently employed from 1848 onward (and maybe earlier) on a variety of labouring work. One of them was John Egan, a 44 year old man who in 1851 was living in Hall’s Passage, Stafford, with his wife and four children. There were six other labourers lodging with them and these men all probably did work as a group at Ingestre if they could get it. The jobs done by John Egan ‘and company’ ranged from dressing bricks and breaking stones to harvesting hay and painting the woodwork with tar. During the 1850s more farmwork was on offer to the Irish because agriculture was going through its prosperous Mid-Victorian ‘high farming’ period. Furthermore, many English farmworkers were now leaving the land to get better wages and more attractive jobs in the industrial towns. The farmers faced an incipient labour shortage and, like contemporary farmers employing Eastern Europeans, the Victorians looked for cheap labour elsewhere. That opened up more opportunities for the Irish. This is shown by what happened on two local farms. Haywood Park Farm was part of the Earl of Lichfield’s estate on the edge of Cannock Chase. During the second half of the 1850s casual (and nameless) Irishmen and women worked on the farm for about three months each year. By the early 1860s ‘Irish Tom’, ‘Irish John’, ‘Martin’, ‘Barney’, ‘Patrick’, ‘Rush’, ‘Michael’, ‘P. Flinn’ and a ‘lad’ were all doing spells of work on the farm for which they were paid between 1s 8d and 2 shillings a day. Only after 1865, however, did an Irishman, Tommy Lyons, find regular employment at Haywood Park all the year round. At Loynton Hall Farm near Norbury permanent employment for the Irish came a lot earlier. In February 1853 three unnamed Irishmen were given two weeks’ work threshing wheat, shovelling manure and muck spreading. These dirty jobs done, they left. Other casual Irish were employed later in the year. In 1854 a change occurred because two named Irishmen were taken on permanently. They were Thomas and Michael ‘Wire’ (?O’Dwyer or Maguire?). Michael left in 1856 but Thomas remained to the end of the surviving data in 1859. 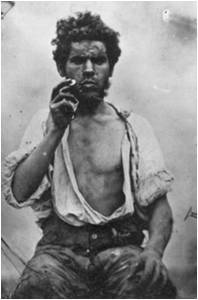 Like John Egan, many of the Irish labourers lived in the Stafford slums and trekked out to the farms every day in all weathers or else they bedded down in barns and shacks in the countryside. It was a hard life and after 1865 their chances of farmwork started to disappear as mechanisation started to replace men by machines. At Haywood Park Farm after 1871 there was almost no work for the Irish apart from Tommy Lyons and the farm’s labour force overall had been cut back. The principle was clearly ‘last in, first out’ and the Irish lost out. They either had to adapt or go elsewhere. Anthony Conner, for example, was, in 1861, a farmworker who lived in Allen’s Court, Stafford, along with five other relatives and lodgers. In 1871 he still lived in Allen’s Court but now he had switched to being a bricklayer’s labourer. His associates had all left the town. Martin McDermott had also been an agricultural labourer but lost his job on the land and ended his years in 1877 cleaning out tubs of human excrement in the Borough Council’s sanitary department. Other redundant and aging farmworkers were also left stranded in a shadowy world of casual work and poverty. Many died as paupers in the Workhouse. They were some of the saddest victims amongst the social wreckage of the Famine. Staffordshire Advertiser (SA), 21 August 1830. Staffordshire Record Office (SRO) D240/E (I)/3/28, Shrewsbury Papers, Industrial Records, wage recordsof Salt and Weston Quarries, 1832-69. SRO, D240/E/F/4/7, Ingestre General Estate and Wages Book, 1848-55. SRO, Haywood Park Farm, Colwich, Labour Book, 1855-80. SRO, D1717/F/4, Loynton Hall Estate, Norbury, Day Book, 1853-9. SRO, D1323/C/4/1-2, Stafford Borough Council Public Health Committee Minutes, 1875-88.